With an overnight layover at Bergamo Airport - arriving at 8:50pm and departing the next morning at 7am, the question was, where to stay? 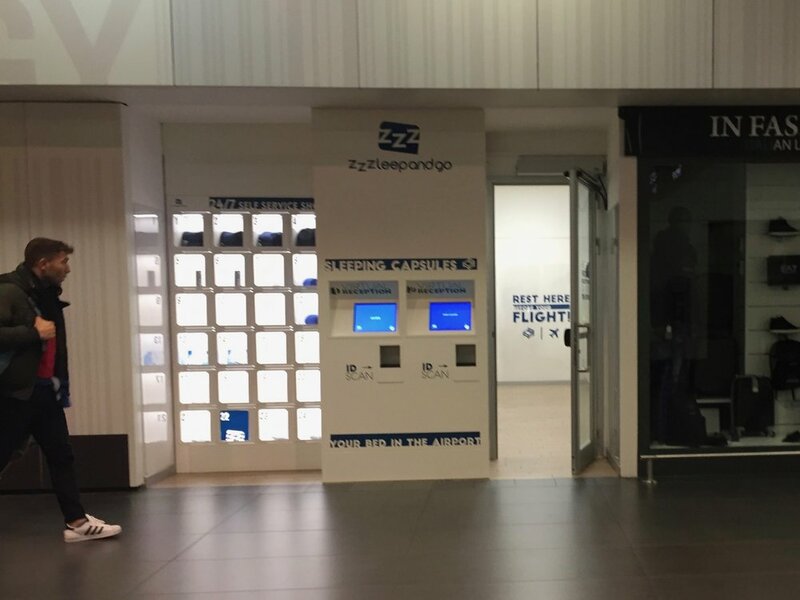 An intriguing option was the "ZZZleepandGo BGY" inside of the airport terminal. Called "Sleeping Capsules," this was supposedly a fully self-service concept where there's no staff at all. However, reading the reviews, it seems like it's hardly any better than sleeping on a bench in the airport, with no soundproofing, no blankets, and no toilets or showers. And from the pictures, it appeared that the beds were like hospital exam tables, where there is a paper-like sheet that rolls across the top, providing some sanitary protection between you and the bed. 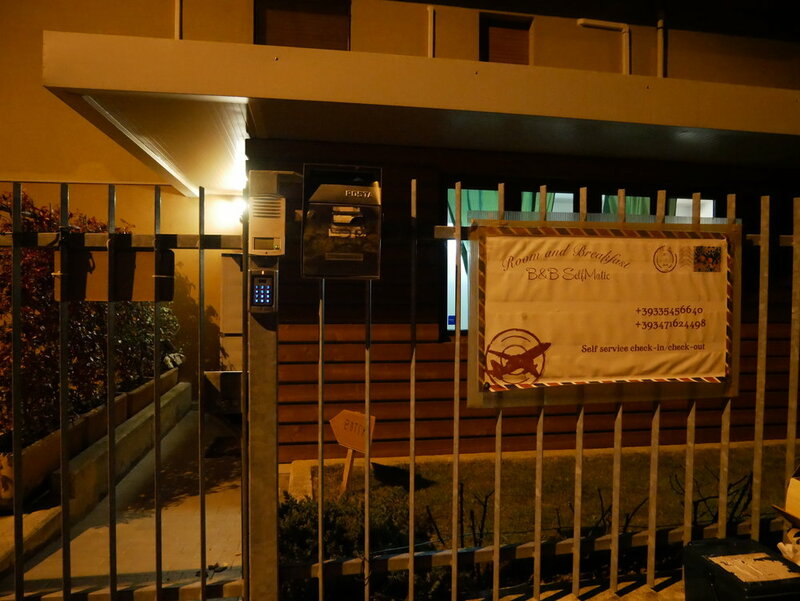 At 50€ a night, almost same price as an actual hotel outside of the airport, I found this to be a bad deal. 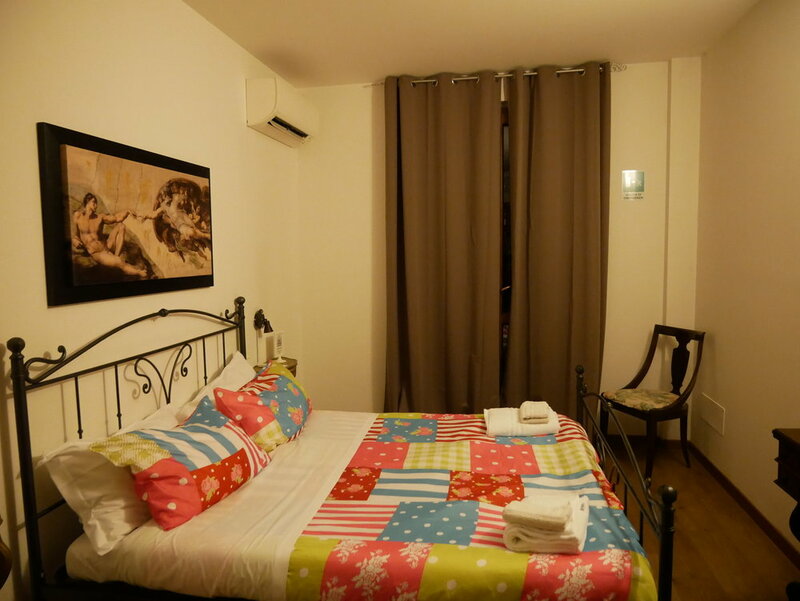 Instead, I chose a place called Guesthouse SelfMatic, for 52.20€ with a Booking.com 10% discount. On the map and reading reviews, it seemed like it wasn't too far of a walk from the airport. Turns out that it wasn't far, but walking in the dark with no one around, all the way around the runway of the airport to the opposite side, wasn't a walk that I was looking to repeat the next day. 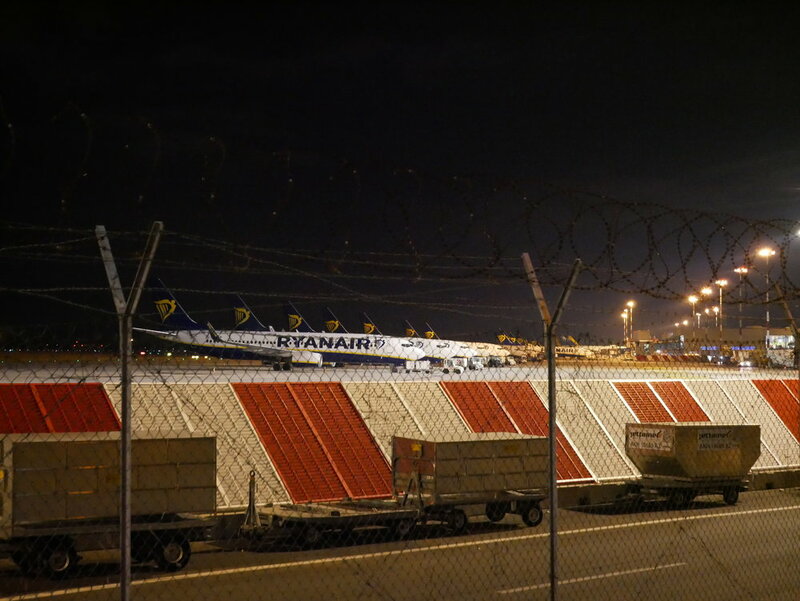 But I did get some nice views of the planes - and could really see how Ryanair is the #1 airline now in Italy! Perhaps a bit like the self-service "sleeping capsules" at the airport, Guesthouse Selfmatic was also self-service. They sent me an email after booking with all of the instructions, including the access code to the gate. After entering the front door, I was to take the key to my assigned room from the hook. In the email they said that our entry would be monitored (from where?!) in case we would take more people in than our booking indicated. A bit creepy! Now just inside of the entry is a fully stocked kitchen, and a breakfast table all laid out with some packaged snacks. They say that they don't provide breakfast, but do leave food in the fridge for us to take, saying in their email, "Food and beverages are a cuddle from the staff, please remember it when you'll write your review!" A "cuddle?" I must say, this did give me an eerie feeling. I felt like I walked into a family's house, who mysteriously wasn't there when I stayed over, yet everything was in place for them to return. The bedroom was nice, and quite warm - a welcome change from the cold winter temperatures outside. The bathroom also contributed to the eerie feeling. There was laundry still in the dryer! It was like someone was about to come in and fetch the laundry, yet I did not see or hear a single other person in my entire stay here. In the morning it was time to make the dark walk back around to the airport. 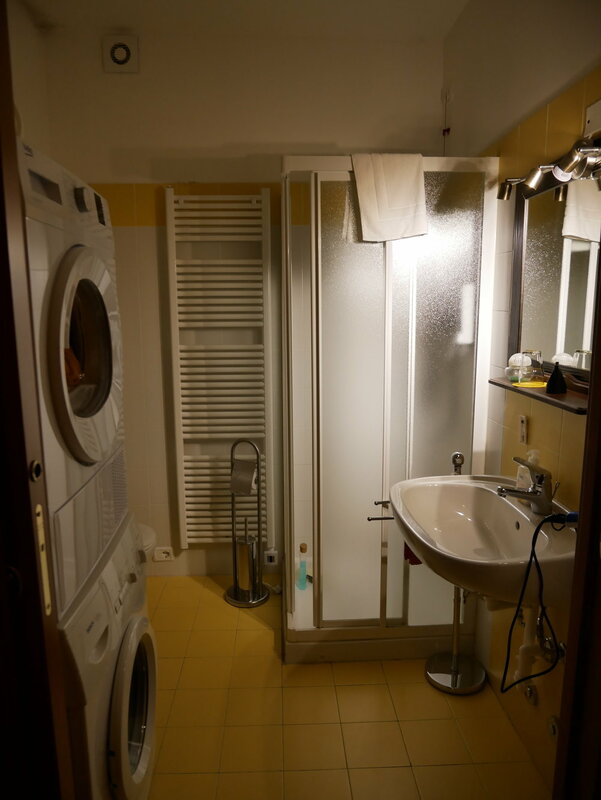 I would certainly consider staying at Guesthouse SelfMatic again, if I had another overnight stopover in Bergamo. But it was kind of a strange feeling staying at a place where there was absolutely no human contact, yet all of the evidence of being inhabited by others. I hear Bergamo is quite a nice city to visit in itself - that it's really much more than Ryanair's "Milan-area" airport. So I might consider a visit to Bergamo proper next time, instead of an overnight stay at the airport.